The Hundred Dresses is a 1944 children's book by Eleanor Estes, illustrated by Louis Slobodkin. In the book, a young Polish girl named Wanda Petronski goes to a school in an American town, in Connecticut, where the other children see her as "different" and mock her. The book centers on Wanda Petronski, a poor and friendless Polish-American girl. Her teacher, outwardly kind, puts her in the worst seat in the classroom and she does not say anything when her schoolmates tease her. One day, after Wanda's classmates laugh at her funny last name and the faded blue dress she wears to school every day, Wanda claims to own one hundred dresses, all lined up in her closet at her worn-down house. This outrageous and obvious lie becomes a game, as the girls in her class corner her every day before school, demanding that she describe all of her dresses for them. She is mocked, and her father, Mr. Petronski, decides that she must leave that school. The teacher holds a drawing contest in which the girls are to draw dresses of their own design. Wanda enters and submits one hundred beautiful designs. 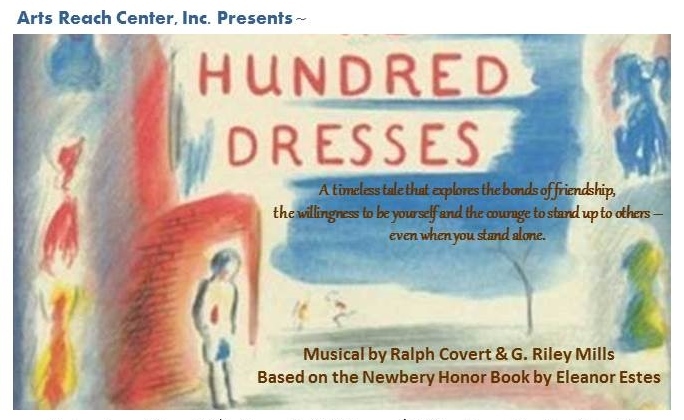 Her classmates are in awe of her talent and realize that these were her hundred dresses. The students who teased her feel remorse and want her to know this, but they are not sure how. They decide to write her a kind letter and send it to her old address, hoping the post office can forward it. Unfortunately, she has already moved away and does not realize she won the contest.